RMT calls for withdrawal of London Underground cuts plans as their own Equalities Impact Assessment shows that key groups will be hit hardest. • Women – forced into lone working, left vulnerable to abuse and assault and disadvantaged by shifts in location and selection and promotion criteria. • Black and Minority Ethnic staff – disproportionately and adversely effected by the proposals with not a single tick in the “Positive Impact” column. • LGBT staff – left vulnerable to abuse and assault in “high risk” locations and where forced into lone working. • Younger people – relentlessly negative impact on apprenticeships, promotion prospects and again left vulnerable to abuse and assault through enforced lone working. “London Undergrounds own assessments show that their plans to axe nearly a thousand jobs, reorganise what is left and to close key services like ticket offices are relentlessly discriminatory and would throw into total reverse gains secured to push the tube forwards as an employer where equality of opportunity is taken seriously. “Important groups of staff will be left vulnerable to abuse and assault as enforced lone working is bulldozed through and opportunities to advance though promotion and career development will be blocked off throughout the structures. “We have yet to see any Equality Impact Assessment as it affects tube users and we are demanding that documentation which will no doubt be just as damning, if not more so, in respect of women, people with disabilities and the BME and LGBT communities. 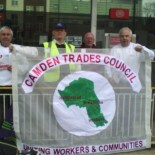 This entry was posted on January 29, 2014 by CAMDEN TRADES COUNCIL.